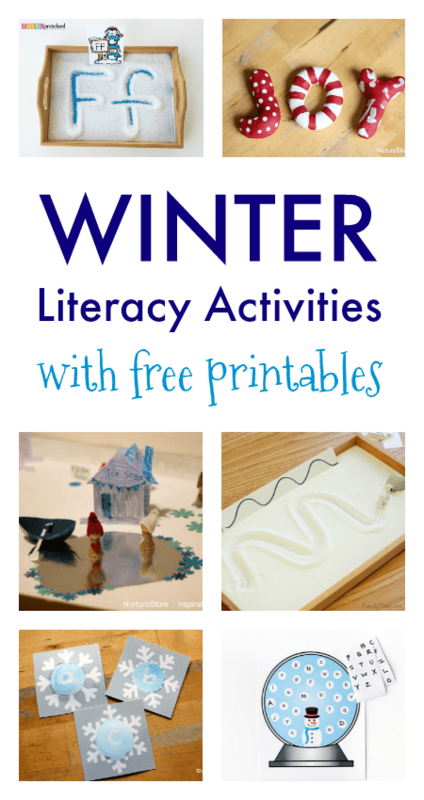 Add play, fun, and sensory learning to your winter lesson plans with these winter-themed literacy activities and free winter literacy printables. Write out your memories of last year and your hopes and dreams for the new year with these New Year review printables. Find printable winter poetry and storywriting prompt cards in my Winter Workshop resources. Use these printable snowflake alphabet cards for magic letter recognition. Encourage little children to make marks in this arctic writing tray. Add these Christmas jokes for kids printables to your lunch box for a fun read every day. Use a snowy small world for storytelling. Practice letters and spelling with this snowy writing tray. Make a salt dough alphabet in seasonal colours. Print and play with these candy cane alphabet cards. Read these favourite winter themed books and delight in stories of snow and ice. Throw snowballs at these letter targets! Match letters with this free snow globe printable.